are a different way to enjoy nature and visit remote landscapes. Indeed, not only the easy pace of the horse does not distort the environment, but also provides enough time to enjoy and appreciate every detail of the landscape. 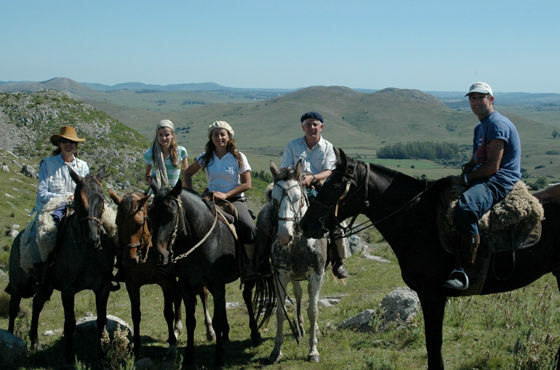 For those who want to live an unforgettable experience we give them the possibility of a ride through the different landscapes of Uruguay, the land of the Gauchos. You will have the chance to visit historical places will get to know our culture and history that has shaped our tradition, of the hand of one of the most ancient transport used by man: the horse! You do not need to be an expert rider. We have horses for different riding levels. Our “gaucho” guides will be supporting every need you have. Our logistic team will organize and prepare the different campsites or comfortable bedrooms in estancias, so you can arrive and enjoy a delicious meal and sit around a bonfire to listen our guitars played by our musicians. Duration: Duración: 2.30 hours of Horse Trek + 1.30 hour of Trekking (Optional). Huellas and Tranquilo Aznarez invites to witness another awsome experience! Historic treks through Sierras de las Animas. Half day rides or one complete day with lunch included is one of the options you can take. Monte de Ombúes and Laguna de Castillos. Landscapes: Monte de Ombúes, Valizas Creek, marshlands and palm forests. We begin our trail on horse-back in the afternoon and we ride cross-country from Puente Valizas, Route 10, km 269, to the Monte de Ombúes – the world´s largest forest of its kind, having trees of 500 years of age. We will enjoy a guided tour through this magnificent and unique forest. At sunset, we will share appetizers and drinks with the group. We will return by boat through the Valizas Creek. 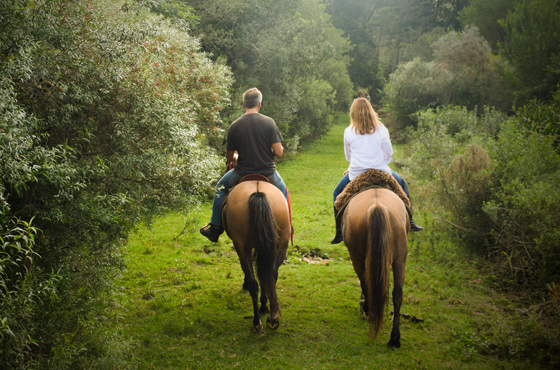 This ride includes: horse, tack and saddlery, appetizers and drinks, tour-guide to the Monte de Ombúes and return by boat. Duration: 2 hours in the morning and 2 hours in the afternoon. Landscape: Dunes, creek, oceanic beach, picturesque town of Cabo Polonio. The starting point of this ride is the beautiful coast of the Valizas Creek (photo). We will be riding across the most spectacular sand dunes, headed to the picturesque town of Cabo Polonio. We will climb the Cerro de la Buena Vista, which really honours its name for you will be surely amazed by the breath-taking views from its top. We will have lunch at the Cabo Polonio beach bar and we will enjoy the rustic natural beauty of this little town which is the home of both fishermen and seals. This ride includes: horse, tack and saddlery and tour-guide. Oceanic Beach, palm forests and lagoons. 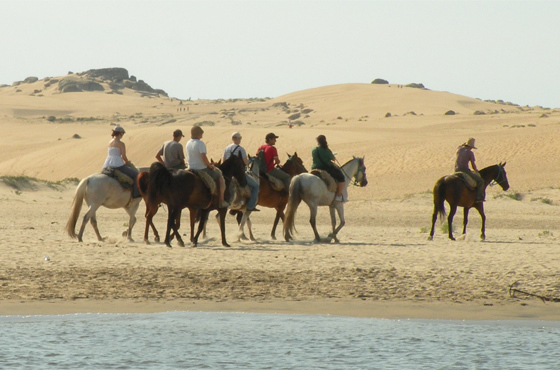 This trek is designed to promenade on horseback through various ecosystems, providing the rider with the opportunity to vividly experience the diverse flora and fauna of each landscape. The starting point of our adventure is the Aguas Dulces beach town, riding across the beach and cross-country towards the northern part of the Laguna Negra, one of the largest fresh water wildlife reserves. 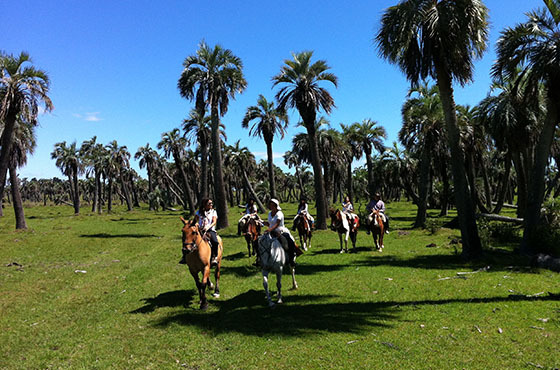 We will also enjoy a ride through the characteristic palm forests of Castillos. Duration: 3 hours in the morning and 1 hour in the afternoon. We will be riding by the stunning waterfall named Salto del Penitente and headed to Villa Serrana (picturesque little lodge town in the hills). We will be hosted in a colonial farm house in a warm and familiar environment. We will be riding through the hills conforming the Sierra de Minas and across the Valley of the Thread of Life. This is an ancient Indian territory, bearing one hundred stone constructions with over 5000 years of age. This trek has great historic and archaeological value. 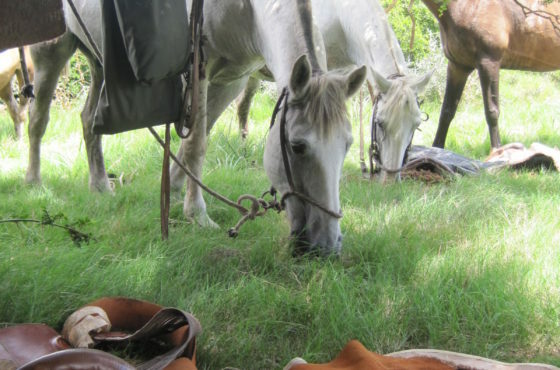 This ride includes: Horse, tack and saddlery, tour-guide and a support team throughout the duration of the trek, including meals, water and accommodation. 2 to 4 day horse trek. 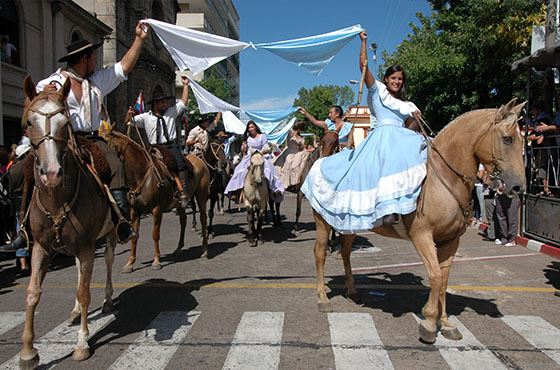 We invite you to celebrate with us the Patria Gaucha, a traditional Uruguayan folk festival in which over 3000 horses take part in a parade during the first days of March. It´s a trip through time which will take you to the past and you will be able to experience the life of the gauchos, you will see typical houses made of mud, see the recreation of the traditional pulperías (country taverns and meat houses) and we will be visiting little chapels of those days. The starting point of this ride is at a distance of 90 km from the place of the Festival. We will ride through hills, forests and creeks to end our adventure in the largest gaucho festivals of our country. This spectacular valley is located at the North of Uruguay. It is known to have a particular micro-climate of 20 degrees and a humidity of 75% throughout the year, therefore it is the home of a great variety of fauna and flora. Waterfalls and breath-taking hills and valleys will provide you with memories to last for a lifetime. And you will want to visit this place again due to the candidness of its people.